Sale of the trading, refrigerating, bank equipment; sale of systems of safety and protection against thefts; manufacture of trading furniture. Creation of shop "on a turn-key basis" - designing and complex equipment by the equipment of shop. 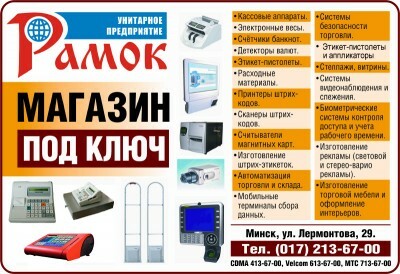 Industrial-trading private unitary enterprise "RAMOK" (UE "RAMOK") has been formed in 1992. The main purpose of creation was promotion of high-technology products and services to the public. The main office is located in: Minsk, Lermontova street, 29, Republic of Belarus. There are also offices in Mogilev, Gomelskoe Highway street, 3 and in Bobruisk, Chongarskaya street, 98, 39 room. Nowadays 46 employees work at the enterprise. The majority of employees of the enterprise have the high engineering education; there is the various process equipment and the instrumentation at the enterprise. There is the different process equipment and control and measurement equipment. Our specialists develop the design; make installation and adjustment different kind of equipment, as well as the installation of the necessary software. Various transducers from one Standard data transmission to another allow flexible approach for solving problem of the automation of the process and minimize the cost of the building of the network. We try to provide all the needs of the customers; we conduct targeted efforts to minimize the cost of our customers and partners, keeping a balanced and flexible marketing, technology, finance and policy. Our company cooperates with many companies all over the world. We have great experience of receipt of goods, certification, promotion to the market of the Republic of Belarus. UE "Ramok" is always open for cooperation, exchange of knowledge and assistance for its clients and partners.